This mango smoothie recipe has no added fat or processed, unhealthy food- it's just a simple but delicious smoothie that will satisfy you on every level. Unlike the banana smoothie recipe, this is a "juicy" but sweet shake. This smoothie can vary significantly in texture and taste depending on how you put it together. I generally enjoy splitting the strawberries and mangoes 50/50, though I sometimes switch the proportions around. I like my mango smoothies a bit cool, so I usually throw in a few ice cubes. Put your fruit into your blender and you're ready to go. The major determinants of taste in this smoothie are the strawberries. I often find the ones you get from the grocery store are tasteless. If you've got a good batch, you'll probably have a fantastic smoothie. Bland strawberries can lead to a drink that has very little taste outside the mangoes, which, I suppose, isn't the worst fate your smoothie could succumb to. I'm often emailed by people wondering what blender is best for making smoothies and other raw treats. I highly suggest the Vita Mix. It's superior to any other blender I've used in the consistency of the smoothies it puts out. It never gets stuck or has trouble breaking up ice or the other more solid foods I put in it. It doubles as a food processor to boot, and it's the best tool I have in my kitchen. 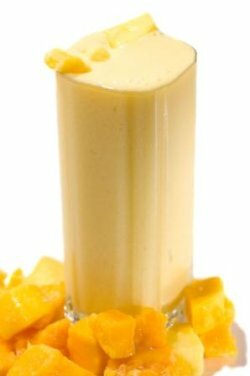 See how a healthy raw food diet and this mango smoothie recipe work together perfectly.